That the Internet is disproportionately populated by weirdos, cranks, racists, and sickos comes as no surprise to anyone who has ever spent time in a chat room or the comments section of a news story. I’ve noticed that a lot of those folks are also paranoid about the government . Strangely, the same people who casually spout all manner of hateful bile in a public forum–the Internet–are often the people who think everything they say and do should remain anonymous. They worry that Big Brother is monitoring them and would like to see laws protecting their right to absolute privacy. Okay, so we have a basic contradiction from the get-go: people who worry that the government is watching them want a law to prevent that. Civics 101 question: Who passes laws in the USA? We could add a socio-economic question: Do you really think you have privacy in the first place? If you’ve ever visited sites on the Internet or ordered online, you’ve left a cookie crumb trail for all manner of advertisers, marketers, retailers, and special interest groups—each of whom develop complex algorithms whose sole purpose it is to track you. Use your credit card or call in an order by telephone and the same thing happens. You have no privacy in the public realm. Get over it. But let me introduce another question: Is it in the nation’s best interest to monitor citizens here and abroad? Before you cite the relentless pursuit of Bradley Manning and Edward Snowden, or the NSA’s extensive phone records to prove the government’s evil intentions, take a deep breath. Ask yourself who is more dangerous, the government or the online trolls you encounter on a daily basis. 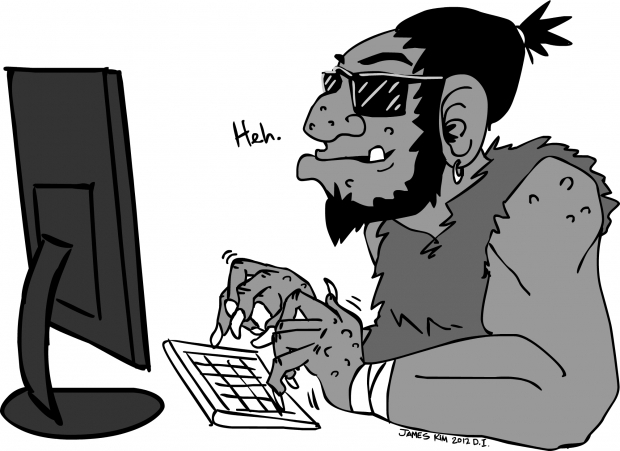 Then ask yourself whether it might be a good idea to keep a close watch on the trolls. Are there, in fact, people that deserve to be monitored? 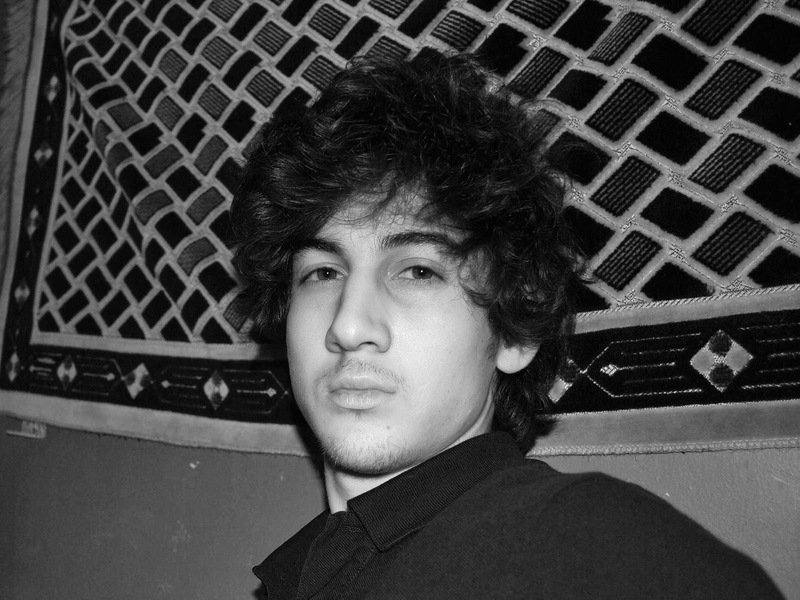 Consider, for example, the gathering movement of those that think Boston Marathon bomber Dzhokhar Tsaraev is innocent. Just about the time you think the human race can’t sink any lower, it manages to do so. I can’t decide what’s most appalling about the “Free Dzhokhar” crowd, the stupidity, the paranoia, or the insensitivity. For the sake of their health, I’d suggest these folks should steer clear of Copley Square. But for the sake of national security, I want their Facebook, Twitter, and Internet activity monitored. This is especially the case of the “Dzhokhar is Innocent” page that has 13,500 followers, many of them abroad. Ditto the followers of the “We are the Lion” Website, which also has lots of overseas subscribers. I want my government to know who these people are, keep a dossier on them, and watch their movements. There are people here in America that worry me. Someone needs to watch Rebecca Lynn Crovello, 20, of Somerville, who told the Boston Globe “the pieces of the puzzle just don’t match up.” Rebecca’s a psych major at RCC and her keen instincts tell her that Dzhokhar is a “handsome kid” and, thus, Navy SEALs actually bombed the Marathon. Gee, Rebecca—I’ll bet you once took a course in criminal justice at Roxbury Community College that makes you a better investigator than the FBI and the Boston PD, who obviously misread evidence such as Dzhokhar’s shoot out with police (caught on video), his role in the murder of an MIT patrolman, the fact that he ran over his own brother, or the forensic evidence linking his backpack to the Marathon bomb. Sure, Rebecca—it happens every day that innocent people exchange gunfire with cops and then lick their wounds by writing anti-USA slogans in their own blood under a boat tarp in someone’s backyard. I want Rebecca watched. Ditto several others who had the courage/stupidity to give their names: Lindy Uros, 45, a Stamford, CT lawyer; and Neda Kidri, 31, of Detroit who calls herself a public relations worker. (I also want all of Kidri’s clients to be watched. A person who’d hire her for PR work can’t be up to any good.) At the very least, I want each of them to come face-to-face with Marathon bomb victims and tell them exactly why they think Tsarnaev is innocent. Maybe they could write a 10,000-word essay in which they carefully, dispassionately, and evidentially disprove the prevailing theory about Dzhok the Joke: that he’s waste of human genetic material. Do I worry about the government monitoring my computer use? A little. But I worry a whole lot more about fools who can’t face reality and people who are so evil that they’d make a pact with the Devil to advance their own fanatical causes. So let me put it in the language of faux hipsters so they can understand: Dude, you deserve to be monitored. For many Americans, the phrase “Canadian culture” conjures images of ice hockey and very little else. This is, of course, the sort of thing that drives Canadians to cold fury (and rightly so). 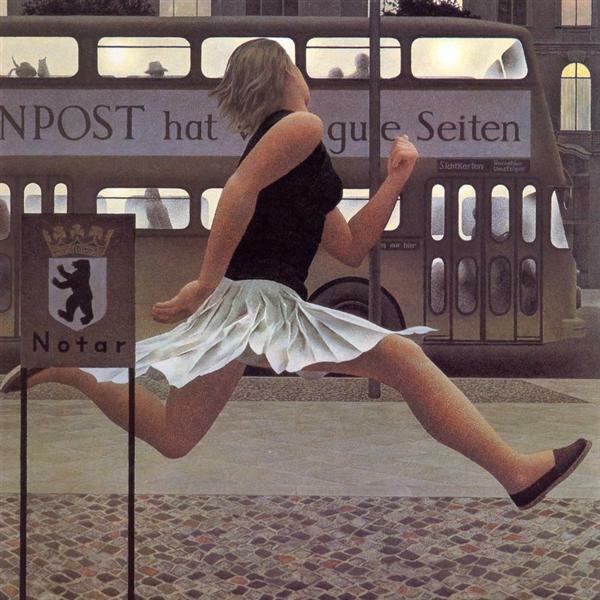 Our neighbors to the North have rich traditions of their own and those looking to put themselves on a crash self-education course to correct past xenophobia could do worse than explore the paintings of Alex Colville, who passed away last weekend. Colville was 92 when he died–a good, long life to be sure, though his art was seldom shown in the United States after the 1950s. 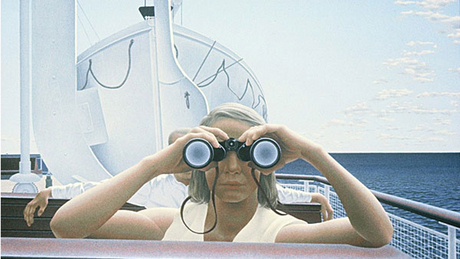 That’s our loss; in Canada, Colville was sometimes referred to as the nation’s painter laureate. Colville admired Edward Hopper, and that influence shows. Many of his works have a detached feeling, as if the central figure is in his or her private physical and mental worlds–even if there are others present on the canvas. One such painting was his 1965 “To Prince Edward Island,” a painting I first saw in Ottawa back in the 1980s, and the one that made me a fan of his work. One can’t help but notice the woman that dominates the work. She gazes through binoculars and, though she’s staring straight ahead, it’s clear she’s not looking at us or anyone else. What, exactly, is she looking at? Note her expression, one that’s every bit as enigmatic as the Mona Lisa’s smile. Now look closer. Colville makes her the center of the work, though she is listing slightly to our right and the weight of the composition is actually to our left. Now look even closer. You probably missed it the first time; there is a man behind her, though we see little but his arms and a glimpse of his head. Who is he? Husband? Lover? Stranger? (Maybe all three!) Notice also how Colville used geometric shapes that give the unbalanced composition the illusion of symmetry. That trick come from another great Colville influence–Precisionism (especially Demuth and Sheeler). Colville delighted in making us wonder what is was we are seeing. 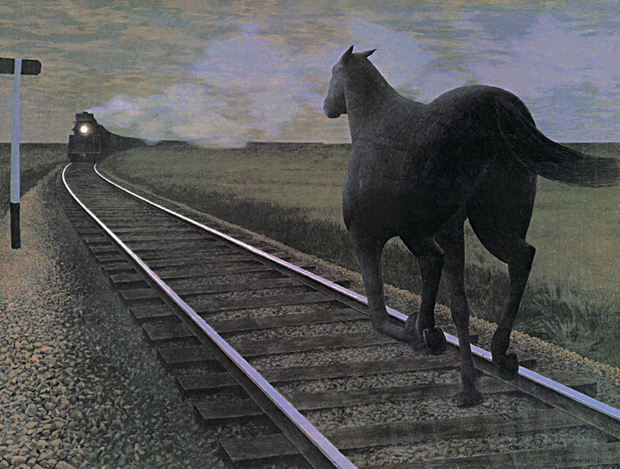 Take “Horse and Train,” a 1954 work that first brought him acclaim. We see a black horse running full speed toward the headlight of an oncoming black train. The sky above might be ominous, or it might simply be twilight. Maybe the horse will veer away in time, but perhaps something more sinister at work here–perhaps a metaphor for the national destructiveness recently witnessed in World War II. Black, after all, is the color of death. Note that the rails and the smoke are tinted blue, the heraldic color of masculinity and sincerity, but also strength, valor, and power. Are such qualities admirable? Surely it depends upon how they are used. Is suicide valorous? 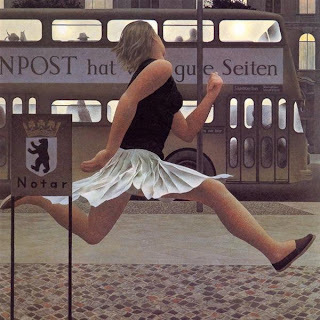 Another personal favorite also displays motion–Colville’s 1978 “Berlin Bus.” If you need any more confirmation of Hopper’s influence, here it is. A young woman in a short skirt bolts down the payment and we do not see her face. Nor do we see those of the silhouetted passengers seated in the bus, though we can tell that they are as disengaged as the young woman is focused. She is in literal flight–like Muybridge’s famed sequential photos. Her feet are off the ground, her arms are pumping, and her drive suggests she’s either going to catch that bus, or vault over it. It’s a small drama, but a powerful one nonetheless. Folk music scholars generally divide those performing traditional songs and tunes into two categories: tradition-bearers and revivalists. Tradition-bearers are those that grew up within a specific folk culture and learned the music in customary and informal ways; revivalists are those that professionalize older music–it’s part of their repertoire, not their identity, if you will. Where one classifies a group such as Zedashe renders such distinctions problematic. 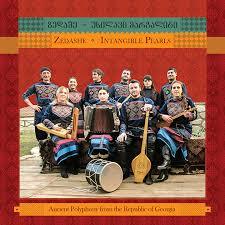 This ten-member group hails from the Republic of Georgia and specializes in music from loads of small villages wiped out by war, Soviet cultural hegemony, and modernity. Some of them grew up with memories of the old ways, though most are too young to have grown up in them. I suppose technically they are revivalists, but their approach to the music is more folkloristic than commercial. It’s certainly not like anything you’re used to hearing. Traditional Georgian music is polyphonic, meaning there are two or more dominant melody lines going at the same time, not just the one found in most Western music. This gives the music a primal, raw quality, a mood enhanced by various voice modulations, keening, and the chant-like structure of many songs. The closest thing in American music is shape note singing in that both styles are stripped down, feature unusual harmonies, and sport unexpected tonal shifts. A lot of the songs are rendered a cappella and what instrumentation there is trends toward sparse and spare. You will hear the chongur, a sort of ukulele/lute hybrid and a button accordion called a garmon that’s often used for its drone-like effects. The garmon serves drone duty because the region’s bagpipe, the chiboni, is a double-chambered affair with a bell-like chanter that has no drones; instead it produces a shrill sound whose sound is roughly like that of a Breton biniou. North American audiences will thus find that even dance tunes such as those heard on the track “Ajarian and Khorumi Dance Melodies” challenge the ear more than the feet.